The 2016 edition will be organized in co-operation with the TEN-T Days 2016 of the European Commission and the European Rail Freight Corridor event organized by the Dutch Presidency of the European Union. The GRFC will offer a natural continuation to the discussions on European corridors and multimodality and move to a global context where innovation and digitalization are at the heart of the success of rail freight. The Global Rail Freight conference on 22 and 23 June 2016 will focus on transcontinental corridors as well as on innovation and its impact on the rail freight industry business models and its work force. 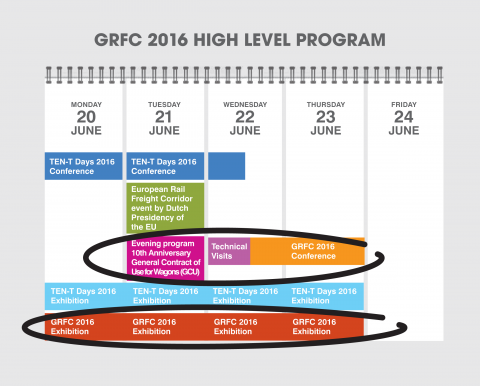 The TEN-T Days 2016 edition, which will also host the Business conference on Rail Freight Corridors and the development of rail freight in Europe organised by the Dutch Presidency of the Council of the European Union, Ministry for Infrastructure and the Environment, will be followed by the UIC Global Rail Freight conference. This conference will offer a natural continuation to the discussions on European corridors and multimodality and move to a global context where innovation and digitalisation are at the heart of the success of rail freight. European Commissioner for Transport Violeta Bulc, in cooperation with the Dutch Presidency of the Council of the European Union, Minister for Infrastructure and the Environment Melanie Schultz van Haegen, invites Ministers, Members of the European Parliament and key stakeholders to Rotterdam to discuss the development of the Trans-European Transport Network, with a special focus on the Core Network Corridors, ERTMS and Motorways of the Sea (MoS), their implementation and financing. The ERTMS session of this year’s TEN-T Days will address 3 major achievements of the Breakthrough Programme. The European Coordinator Mr Karel Vinck will present his proposal for the new European ERTMS Deployment Plan for the Core Network Corridors (CNC’s) and the nine business cases for ERTMS deployment along the CNC’s. Another major achievement is the commitment made by the European Railway industry to deliver compliant and interoperable on-board equipment that is able to run on the entire European, B2 and B3 compliant infrastructure. Please have a look at the conference programme of the TEN-T Days on 20-22 June. The UIC Global Rail Freight Conference provides a platform for all stakeholders involved in transport and logistics across the world, such as representatives from railway companies, logistics companies, ports as well as forwarders, infrastructure managers, shippers, researchers, policy makers, students and young professionals.